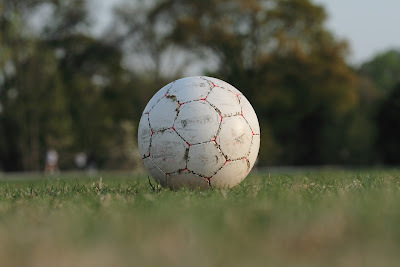 I was instructed before writing this post that the theme should fit in with one of the ‘five Fs’ - family, football, food, fitness or fun – and so being the awkward person I am, I decided I would challenge myself to make it fit in with all of them. I have quite a small family, but on my Dad’s 60th birthday last year we managed to get about 15 of us together to celebrate with a wholesome family picnic. (Food, family and fun – check, check and check). My Dad’s birthday is in November, which isn’t exactly ideal picnic weather, and the light drizzle and biting wind wasn’t exactly adding to the occasion. Someone, (not me), came up with the idea of us all warming up with a game of football. (Football and fitness – check and check). I felt a bit like how I imagine an alcoholic feels when they accidentally find themselves in a pub – I knew I wanted to play, but I also knew I shouldn’t. I have a reputation in my family for being a tad over-competitive, and team sports like football don’t exactly bring out the best in me. My partner recently played Monopoly with me and has vowed never again. Something about me making games Not Fun. I could surely control myself in a friendly family game of football though? My then eight-year-old daughter Belle was a team captain. “You really should pick me,” I warned her. “You don’t want to be playing against me.” She didn’t listen though, foolish child. The rain was coming down steadily as we kicked off. I began calmly, trying to remain light-hearted, but then Belle’s team scored a goal and suddenly I was shouting at my team mates and scowling. They scored another, and it was all too much. Belle had the ball, ready to shoot, her face eager and excited. I went in for what I meant to be a gentle tackle, but completely knocked her legs out from under her. She lay crying in a muddy puddle. Everyone looked at me. “I did tell her not to play against me!” I said, in a pathetic attempt at self defence. Remind me never to play Jo at anything, not ever. Huge thanks to her for writing this post.